Careers Cost > How Much Does Mall Advertising Cost? How Much Does Mall Advertising Cost? One popular way to advertise your business is via mall advertising. With this advertising method, your business will be able to advertise on billboards located throughout the mall, usually within the pathways. The cost of advertising within the mall will depend on the mall, time of year, the location of the billboard within the mall and how long you plan on advertising. 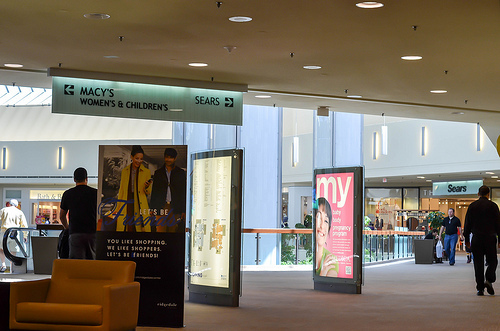 On average, advertising rates within the mall can range from $700 to as much as $15,000 per month. Generally, the longer your advertising contract is, the more you are going to save. Most malls, on average, will ask for a minimum contract length of at least 6 to 12 months. A backlit diorama, the most common advertising option, will be the rectangular box-shaped advertisements that sit vertically in the walkway. Every few seconds, the advertisement changes, rotating through four to six ads at a time. Something like this, depending on the mall can cost as little as $600 to more than $3,000 per month. bluelinemedia.com proclaims it can cost $750 to $2,500 per four-week period at most major malls in the United States. For a simple poster that sits on a stand near the escalators, for example, the price can range from $500 to $2,000 per month. A tall sign that measures six feet tall and is placed near a heavily trafficked area, such as the food court, can cost $800 to $4,500 a month. Some malls offer floor decals that apply to the floor, similar to a window cling. These tend to be stickers that measure three feet wide and can cost $1,000 to $6,000 per month. For an interior banner that hangs from the ceiling, the cost tends to be higher and can reach upwards of $3,500 to $10,000 a month. Some malls also allow exterior banners that can hang outside the mall, and these ads can cost $4,000 to $12,000 a month. At the Mall of America, a month-long campaign could cost $10,000 per month for one banner or $18,000 per month for two banners. An elevator wrap, which can either be wrapped on the interior or exterior, can cost $500 to $2,000 per month. For vacant kiosks or even a window, many malls will allow local companies and stores to set up a temporary display. These displays can cost anywhere from $500 to $2,500 a month. To see an example, the CambridgeSide Galleria has a list of their advertising rates within their mall. For example, a simple 22″ x 28″ poster can cost $600 per month, while an interior banner inside this mall retails for $3,000 plus $500 for installation. Mall advertising can be done in a variety of ways, but the most common tend to be via a backlit diorama, banner hanging from the ceiling, as an elevator wrap or even on a tabletop in the food court. Most advertisements will be located near anchor stores, elevators, escalators and food courts. Units can be two, three or even four-sided with back lighting capabilities for maximum exposure. At some locations, video and/or digital displays are available. Before an advertisement contract is signed, a mall and/or advertising agency should be able to discuss where the advertisement will be placed and how many people will see it in a given month. The poster design will be an additional expense to consider. Many malls may have their own design service you can work with and the costs will depend on the complexity of the design. Exterior and interior banners will often have an installation fee set by the mall and can cost $300 to $1,100. If you were to work with an ad agency instead of working with a mall directly, some may require you purchase at least 10 to 15 advertisements at a time before they work with you. Matrix Media, the outdoor advertising experts, claim the average mall shopper visits three times per year and close to 80 percent spend $65 on their 80-minute average trip. The longer your contract is, the more you’re going to be able to save. See how much you can save if you were to sign a longer lease and pay up front. Some malls offer government and non-profit agencies discounts.